Tiger Woods was Tiger Woods on Sunday. He’s clearly always Tiger Woods, but this was Tiger Woods™, the version that lifted golf from niche to national consciousness for more than a decade before being undone by his own varied vices. None of that was apparent today, though. Hyperbole is abundant in the world of sports and sports coverage, but for once, there’s really nothing you can say that would oversell the scale of this story. It defies overstatement. Woods, having returned from lows entirely of his own doing, injuries that may have been partly thanks to his own habits, and even a few extra humiliations that weren’t his fault at all, looked less like a player winning via veteran guile and more like a player capable of being the best in the world once again. Woods entered the day two shots behind Francesco Molinari, but playing in the final group with Molinari and Tony Finau, Woods offered the sort of solid display that ground down his playing partners over the course of the round. Molinari, in particular, seemed to feel the pressure; having recovered from nearly every mistake he made throughout the tournament, Molinari dumped two balls in the water (on 12 and 15) that ended his chances. As Molinari fell down the leaderboard, he brought plenty of others into contention. Brooks Koepka lingered near the lead all day, but could never quite make the charge necessary to come out on top; he finished tied for second with Dustin Johnson and Xander Schauffele. 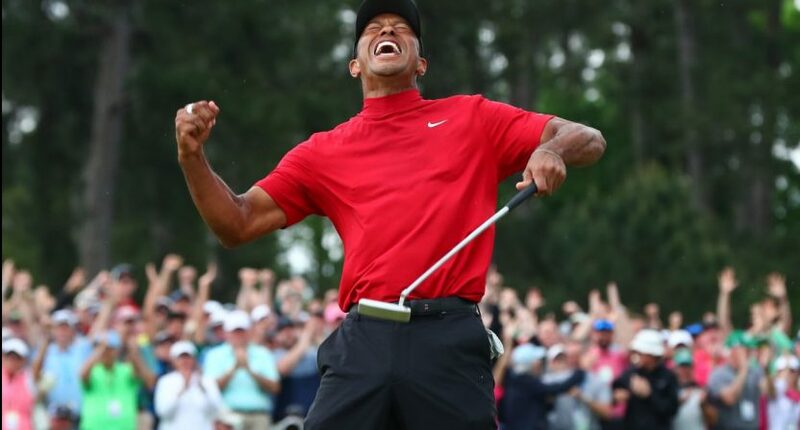 And then, with storms rolling around and towards Augusta, there was no one around Tiger, and there were no holes remaining, and that was it. There was nothing left between Tiger and us an but a tap-in. Tiger’s story is complicated. Plenty of people don’t like, have never liked him, and won’t ever like him. Many of them have good reason. But there’s no denying the story; Woods was by some reports immobile just a few years ago, requiring spinal fusion surgery just to be able to compete again. Even then, his on-course game was clearly not what it was, with many questioning whether it would ever return. The win also highlights plenty wrong with golf, most notably the lack of diversity still apparent at the top of the sport. The last time a black player won a major before today: when Tiger won in 2008. There’s also the continued reliance on Tiger for national relevance; the ratings for the weekend are going to be enormous, even with today’s round ending early in the afternoon. Tiger Woods was a prodigy who became a phenom who became, in many ways, a pariah. He’s not redeemed in everyone’s eyes, of course. Nothing is going to accomplish that. He is, though, the Masters champion, and that title isn’t the only thing that fits.